The DNAinfo archives brought to you by WNYC. Read the press release here. 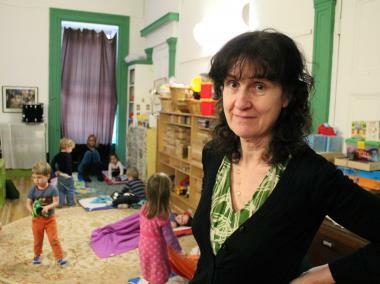 Eileen Johnson at Little Missionary’s Day Nursery on St. Mark’s Place. EAST VILLAGE — Eileen Johnson, the director of Little Missionary’s Day Nursery on St. Mark's Place, had been working on her book about childraising tips for years when a Yale professor's self-proclaimed "Tiger Mother" memoir hit the stands. Johnson, who said she couldn't make it through the “Battle Hymn of the Tiger Mother," deplored author Amy Chua's emotionally troubling techniques on how to raise children “the Chinese way." Chua’s child raising theory, which includes not allowing children to have play dates or bathroom privileges, is built on the philosophy that anything less stringent lets children fall off the path to a successful life. But Johnson said she sees her book, “The Children’s Bill of Emotional Rights," as the antidote to that kind of thinking. 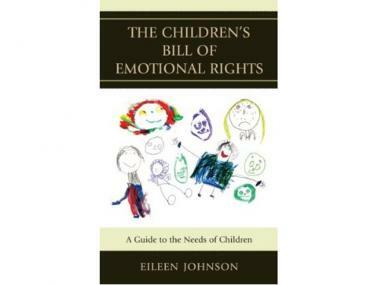 The cover of Eileen Johnson's new book "the Children's Bill of Emotional Rights. "To me that is someone who is manipulating to get their child to do you want them to do," said Johnson, who has been the director of Little Missionary’s Day Nursery since 2001. The nursery, which occupies the bottom two floors of a brownstone on St. Mark’s Place between First Avenue and Avenue A, is one of the oldest in New York. "That is the opposite of what we are doing here." Johnson, who has been in the education industry for 30 years and has raised two daughters who are now in their 20s, said her philosophy centers on the theory that "children need to be respected. Their boundaries need to be respected." Her book, which is out this month, marketed to parents, teachers and psychologists, is rooted in academic research and is brought to life by stories from Johnson’s own experiences. Divided into chapters such as “Children have the right to play” and “Children have the right to be protected from bullying,” it centers on how to negotiate emotions as a child learns. Johnson encourages parents to acknowledge a child’s emotions without forcing a feeling into positive or negative categories. Happy feelings are not always good and angry feelings are not always bad, but all are important to the child's development. The book helps deal with those unavoidable emotions that can be confusing and even hurtful to parents or those who work with them. “You are vulnerable when you are a parent,” said Johnson, as she reminisced how strangers would approach her on the street giving unsolicited instruction how she should raise her children. “Take a moment to recognize ‘It is not a reflection of me'," she recommended, adding that too often, parents "feel like it is your job to fix" their children, promopting them to manipulate and attempt to control their children in unhealthy ways. Often in an attempt to be in charge, parents impinge on their child's rights. They fail to recognize them as a human being, but rather see the child an extension of themselves. Little Missionary's Day Nursery was founded in 1896 by Sara Curry, to give working parents of the Lower East Side a place to leave their children during the day. While the school is classified as a non-profit, parents pay $1,200 a month for a spot, an amount that is good value for a nursery in New York City, according to Johnson. Not only does Johnson's methods create a relaxing learning environment for children, it also improves the teachers' work day. “When you try to control something all day long you are exhausted at the end of the day," said Johnson, who partially attributes this method to high levels of burnout in teachers. “Unfortunately, a lot of teachers are just managing emotions," she said. Eileen Johnson’s book, “The Children's Emotional Bill of Rights,” can be purchased from Amazon. DNAinfo is New York's leading neighborhood news source. We deliver up-to-the-minute reports on entertainment, education, politics, crime, sports, and dining. Our award-winning journalists find the stories - big or small - that matter most to New Yorkers. Copyright © 2009-2018, New York Public Radio.